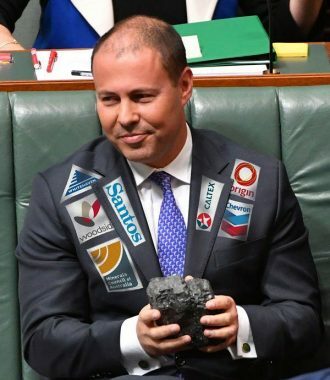 In the face of a challenge from Oliver Yates, Josh Frydenberg has defended the Coalition’s record on climate change action. Well he tried to … with a load of rubbish. He said he was “proud of the work we’ve done to support the renewable energy target”. First they called for it to be scrapped. Then they reduced it from a 41,000 gigawatt hour target to 33,000. And now Abbott et al are calling for it to be scrapped again. There are strident calls from the Coalition to cut any subsidies to renewables but for the government to, as well as continuing with fossil fuel subsidies, actually underwrite new coal-fired power stations and to subsidise coal infrastructure. Josh is “proud” of the Emissions Reduction Fund, but not proud enough to put any more money towards it, which is not surprising since it hasn’t worked to reduce emissions, has allowed the big polluters to increase their emissions without penalty, and has had several contracts revoked for not delivering on promised reductions. He is “proud” of Snowy Hydro 2.0, “the world’s biggest pumped hydro scheme”, except it is still only an idea that no-one has committed to pursuing because it is going to be hellishly difficult and expensive to build and will take a long time to complete. Josh bragged that his government had seen emissions reduce to their lowest per capita level in ages – which means absolutely nothing when total emissions have been rising every year since they got rid of carbon pricing. The latest government projections show that Australia will miss its 2030 emissions reduction targets, with emissions in 2030 projected to climb 4% above 2020 levels. You have nothing to be proud of, Josh and your lies will be exposed by a far more capable and well-informed opponent. And then there is craig kelly! God help us! Really, were these people dropped on their heads at birth? Did they get the answer wrong when asked, choose one, would you rather have a full frontal lobotomy or a full bottle in front of me? Just another day in the life of lnp delusional wankery. F*ck, whenever I think can it get any more weird, I know it will. Craig (chicken little) Kelly — help help the sky’s falling Labor’s coming all be living in caves they smash the economy help help. The lot of this scum and dross are well overdue for a checkup from the neckup. Tony Abbott at least put on an air of pretence about caring about the environment/climate change; remember his Green Army? This current government have given up on all of that and are of course hoping that a scare campaign will be considered ‘policy’. I can’t wait for them to explain how prosperous we all are given years of wage stagnation. Who (apart from your good self)? If we could only get Bill to commit your effort above to heart and to coach him how to deliver the speech (ANY speech!) as it he meant it, we might be in with a show. I think Rudd (boo, hiss, snigger, eyes rolling to heaven) was the last one to really believe we had to do something about climate change but that was 11 years ago. The most heartening event last year was the school kids rally about climate change. When they rally again and again during the election campaign, as surely they must do, climate change just may displace the bloody economy as the principal issue. Maybe one of the renegade Liberals running against a Liberal? Don’t get MAD!!! Get them out of government!! The LNP are in the process of destroying thousands of jobs relating to the Great Barrier Reef. The South Australian Royal Commission suggests that climate change has been ignored in the Murray/Darling Basin. I think we are in serious danger of having “Snowy 2.0” thrust upon us, when it may not be the best solution to the intermittent nature of most renewable energy schemes. I conclude this because people and pollies have become sentimentally attached to the “iconic nature” of the original Snowy Scheme and that could lead to Snowy 2.0 escaping proper scrutiny. I am horrified when I read of the huge construction cost estimates and the rarely mentioned enormous costs of the essential new transmission lines that would be required to make Snowy 2.0 a reality. The long timeline to bringing it on stream also concerns me. Which leads me to ponder whether it may be far cheaper and quicker to spend such money on a number of smaller schemes dotted around the country so that we also get geographic diversity. As I understand it, Snowy 2.0 is projected to provide about 2000MW when fully completed. I am keen to learn what the cost of building four 500MW pumped hydro schemes or perhaps eight 250MW schemes might be in comparison to the full cost of Snowy 2.0. Surely someone has done those sums. We already have an excellent example of a 500MW pumped hydro station at Wivenhoe just west of Brisbane – that was put in during the notorious Joh days and has operated since 1984. All it needs is to have its pumps powered by renewable energy rather than off-peak coal generators – we hope that the Palaszczuk Government is heading in that direction. Would the cost of building a bunch more “Wivenhoes” on existing dams be competitive with the cost of Snowy 2.0? but stagnant wages for the last 5 years are not all Labor’s fault surely? How is it that the Federal Court found Adani not an emitter? Are its judges for sale? The Court must have published its reasons? And how is it that Josh wears a jacket plastered with fossil company logos, becoming a walking advert for them? Was that a condition for his party taking massive donations? Someone, please explain. What happened to the much trumpeted Direct Action plan that was supposed to solve all our climate problems following the repeal of the carbon tax. Does it fall into the category of debt and deficit disaster NEG climate change is crap lets knight the Duke, how about this for an NBN and if you have a go you’ll get a go. Meaningless vacuous crap. ANU have done an excellent study on small scale pumped hydro potential identifying over 22,000 sites. The stickers on Josh’s coat were added by a clever meme person. The coal however, is real. This link gives a good summary and further links to past and ongoing court action. Adani decision may be legal, it’s just not lawful. What a bleak future we may be facing! Ozone created by electric cars now killing millions in the seventh largest country in the world, Little India, formerly known as Australia. White minorities still trying to have English recognized as Australia ‘s third language. Children from 2 parent heterosexual families bullied in schools for being ‘different’. Kookaburra and platypus plague threatens North Western Australia crops and livestock. Melbourne schoolgirl expelled for not wearing burqa: Being a Christian is no excuse says school. Sharia law must be enforced. Japan announces that they will no longer consume whale meat as whales are now extinct and the scientific research fleet are unemployed. Australian Government have told the Japanese that cane toads taste like whale meat. Australia now has 10 Universities of Political Correctness. Professor Goldman of ANU says there is still a long way to go in the fight to stop people saying what they think. Australian Deficit $10 trillion dollars and rising. Government declares return to surplus in 100 years which is 300 years ahead of time. Prime Minister Mohammed Youssef claims increased growth through more immigration secret to success. France pleads for global help after being taken over by Islamic Countries. No other country volunteers to come forward to help the beleaguered nation! Castro finally dies at age 130. Cuban cigars can now be imported legally into the USA, but US President Chelsea Clinton has banned all smoking. Jose Manuel Rodriguez Bush says he will run for second term as US President in 2032. Australia Post raises price of stamps to $18 and reduces mail delivery to Wednesdays only. After a 10-year, $75.8 billion study Scientists prove diet and exercise is the key to weight loss. Average weight of an Australian drops to 115 kgs. Global cooling blamed for citrus crop failure for third consecutive year in Vicindia and New South India. Senate still blocking drilling in Canberra even though gas is selling for 5,000 Rupees per litre and gas stations are only open on Tuesdays and Fridays. Supreme Court rules punishment of criminals violates their civil rights and Victims to be held partly responsible for crime. New federal law requires that all nail clippers, screwdrivers, fly swatters, and rolled-up newspapers must be registered by January 2035 as lethal weapons. Australian Tax Office sets lowest tax rate at 75 percent. South Asia (formerly Northern Territory) voters still having trouble with voting machines. Regardless of who wins the next election in Australia, the risk of severe recession in Australia will be very high. If the results of the Banking RC lead to heavy fines and jail-time for illegal or fraudulent behaviour, don’t expect help from the banks. I worry about Josh! Is he eligible for an Israeli passport if he needs to do a “runner”? How can anyone take Frydenberg seriously after watching that? David Bruce – a silly fantasy, not funny and a waste of time and space. You need to do more homework on real climate change science. Was that your own brain shart or an extract from the ghost written sequel to ‘Pauline Hanson The Truth’? That’s what I have been saying for years ;hope Oliver Yates will be more successful than what I have been…The word change appears six time in that short paragraph, good on you Oliver…. @David Bruce: This novel post bears a close resemblance to racism and gross intolerance. I would have thought that your post would have noted that the Australian Common Market allows Australian citizens to travel through the Japanese territory of Queensland; Israeli citizens are permitted visa free entry to the province of South Zion on Port Phillip Bay; however Australians are reminded that visas are required to enter the southern PRC province of Western Australia; all Aboriginal persons have been re-located to Oolarana around Ayres Rock and natural borne Australian voters are only allowed to exercise their franchise when their permanent residence is in Tasmania. Nobody wanted South Australia. From what I can gather, Warren Mundine wants to turn South Australia into a nuclear waste dump. The half-hour doco on the Banks on ABC Friday evening was good also.